Whenever I stumble upon an antiques mall that has a “Clearance Section” I am like a heat-seeking missile with one goal in mind- to find a broken vintage treasure (on the cheap!) to become my next repurposing project. And so, when my eyes fell upon this old washboard that was missing the actual washboard, I knew it was a moment of crafting kismet. 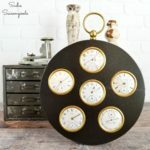 It screamed primitive decor to me and I wanted to upcycle it into farmhouse wall decor. I think we can all agree that this old washboard has paid her dues- between her missing washboard, her warped legs, and the fact that her frame would shift in your hands, she was in desperate need of some TLC! To some, she was beyond repair, but to me…she was the poster child of possibility. This post contains affiliate links for your crafting convenience. The first thing I needed to do was stabilize her “moving” parts because, well, they shouldn’t slide in and out like that! So I carefully applied some wood filler on the back side- in crevices and joints that couldn’t be seen. To help it dry effectively, I made some make-shift clamps to hold everything securely using rubber bands. I let everything sit overnight to dry and set. Then, I decided to deepen the wood color of the old washboard – but not with stain. I tested stains on the back and they were all too dark for the parched wood. So, all I did was wipe down the frame with wood oil using a soft, clean cloth. It’s amazing what a little wood conditioner can do! Now- to complete my transformation into farmhouse wall decor or a farmhouse frame, I needed some chicken wire! I had decided to transform the old washboard frame into a rustic photo frame/holder, and chicken wire seemed like the perfect medium for that! I asked my local farming pals if they had any extra laying around, and The Farm at Rabon Creek came through for me! I didn’t take time to measure out how much I needed for my chicken wire frame, but rather laid out the chicken wire on my old washboard and grabbed my wire cutters to trim it down to size. Using my staple gun, I then carefully fixed it to the back of the old washboard – pulling it taut while trying not to affect the shape of the wire. Then I trimmed off the excess with my wire cutters again. Ta-da! My old washboard all dolled up into farmhouse wall decor / farmhouse frame! One last step, though- I went through some old family photos and selected a few favorites of my grandparents and great-grandparents to clip to the chicken wire. Those miniature clothespins are just so handy. I’ve used them in several projects now, and they really are ideal for a chicken wire frame. There…just perfect! 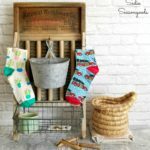 Primitive decor and farmhouse wall decor all from an old washboard that was upcycled into a chicken wire frame. I love it!! Looking for more repurposed rustic farmhouse decor ideas? Make sure you check out my other Fixer Upper-style projects here! Aw, now she gets to live life as a decorative piece instead of a working piece. I’d say she earned it! Looks great. I’m glad you rescued her! That is a perfect way to say it!! I think I’m in love. Great repurpose! Love it, Sarah! Thanks for sharing @Vintage Charm–pinned! That’s fun! I want something to clip photos onto, so I will keep my eyes open for anything that will lend itself to some kind of redo like this. Thank you for sharing. Thank you! A picture frame…or old crib rails…or a window pane…any of those would work! Perfect farmhouse style. I love how you can think outside the box and repurpose something–to me it looks like it comes so easily to you. Love it! Very cool, as usual! My mom had one of these vintage wash boards. Kinda wish she had kept it. Visiting from Remodelaholic. That is so cute & a great repurpose! Pinned. Thank you! I chuckled when I saw your recent washboard post and figured we were DIYing on the same plane!!!! I really like this idea. I could even see it done with some lace or doily in place of the wire. I wish the logo showed up better. Thanks, Rose- in person you can read it a little better. It was originally a brass washboard (based on the brand name) and was from Chicago, IL. Good idea, indeed 🙂 I feel I could really use it! I love, love, love the way this came out! It would be great if I could find an old wash board because I could do something like this and up it in my office! Yay, clearance!!! 🙂 Thanks so much. What a good idea! 🙂 Looks unique and nice. Love your reuse for old delapidated wash board, brilliant. 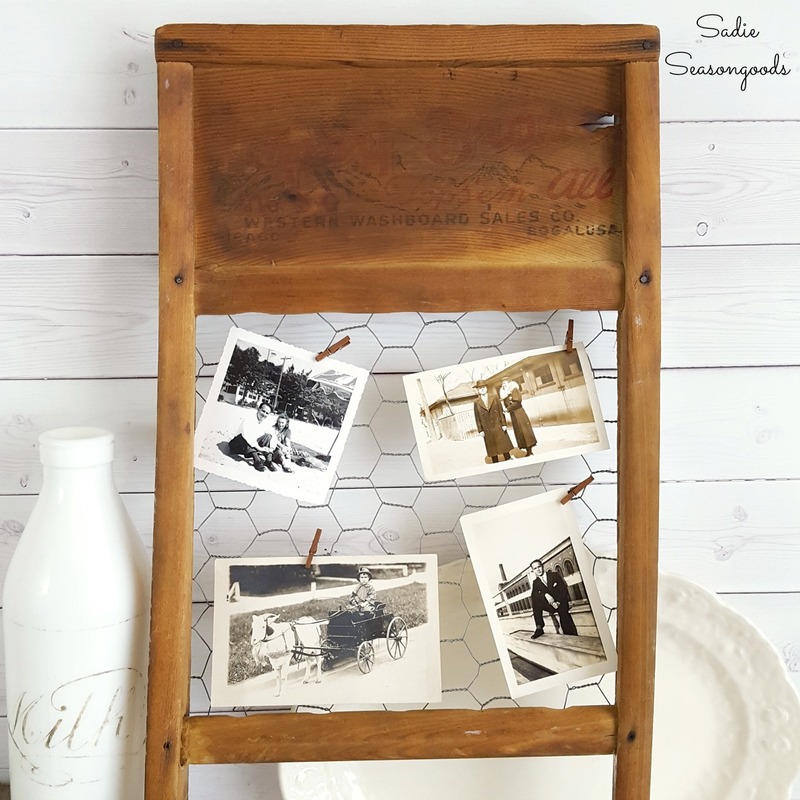 Wonderful idea showing really old family photos, no framing involved. Every time you feature a reuse I want to make one also. Do have wash board bought in either MT or KY which never gets used so just might have to do some taking apart, do have some chicken wire or hardware cloth wire. Now all I have to do is find that wash board. Been busy making things can do in house, too darned hot to even hang sheets out. Will be 104 tomorrow, phewy. Love all your projects, always a winner. Ugggh, 104?? That is just too dang hot to do ANYTHING!! What a great idea! Makes a cute photo holder! I didn’t know that antique malls had clearance area. I will have to ask at our local antique mall to see if they have one. What a clever idea, Sarah. It looks great as a rustic frame. This was the Most Clicked from last week’s Snickerdoodle Party. All of the co-hosts will be featuring it today. Thanks for partying with us! Thanks so much, Beverly- I appreciate that!! I love it! I love anything old and repurposing that washboard was a wonderful idea. What a cute idea! Love it! Enjoy weekend.